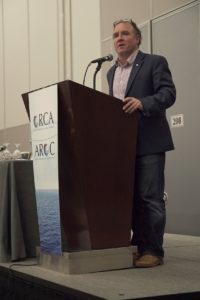 Geoff Green was a keynote speaker for the Oceans Research in Canada Symposium (ORCA) 2018 on April 25, 2018 at the Shaw Centre in Ottawa. He delivered an engaging talk about what was learned throughout the Canada C3 expedition (a Canada 150 Signature Project that Geoff led in 2017) about our oceans and coastline through not only the science conducted onboard, but from the many Indigenous and non Indigenous coastal community members who are stewards of these lands and waters. He spoke about the importance of ocean literacy and of collaboration between Indigenous communities, scientists, politicians and the public . The ORCA 2018 Symposium is a new initiative to address challenges and opportunities among the ocean sciences and technology community. How do we improve Canada’s capacity to perform science at sea? How do we increase public awareness about the importance of healthy oceans? How do we strengthen the linkages in the ocean science innovation sector? Geoff’s experience leading the Canada C3 expedition, connecting Canadians from coast to coast to coast, included a nationwide collaboration around ocean science research onboard the expedition. Geoff’s insight contributed to discussions and understanding around ocean literacy and education at the Symposium. Learn more about the ORCA 2018 Symposium on the Government of Canada website.